Card.Ly is a online web service that doubles up as your online portfolio showcase and a mini-business card. Using Card.ly you can build up your online social portfolio in no time. Card.ly comes from the creators of Tinychat. Using Card.ly is very simple. There is a personal section where you need to enter your name, bio and other contact information. In the social section you have to choose from a list of social networks where you have an account. You are allowed to select only 6 social networks. Once you upgrade to the premium version, this bar of 6 is removed. 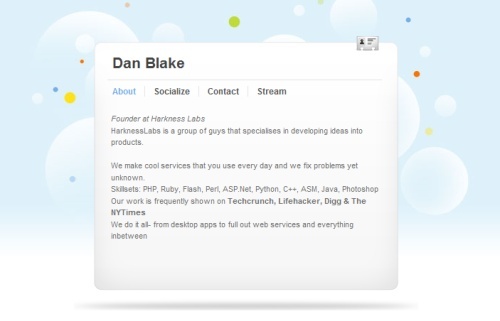 Shown below is a typical card.ly profile page. Other salient features of Card.ly include the ability to claim any nick name and set it as their profile URL just like facebook. You can also liven up your online business card profile with the tons of unique, professionaly designed themes that are fully customizable. The premium version has even more themes. There is also a live "Stream" like friendfeed and facebook, so users can see what you are doing, in real time. You can also use the embeddable widgets to easily link to your card.ly profiles in forums, emails, etc.. The premium version also has added benefits like the ability to use your own domain, have webstats, use professionally designed themes for your card, get unlimited RSS streams on your live stream page (which is limited to only 6 in the normal version). The premium version also has no ads and no "powered by card.ly" banner.